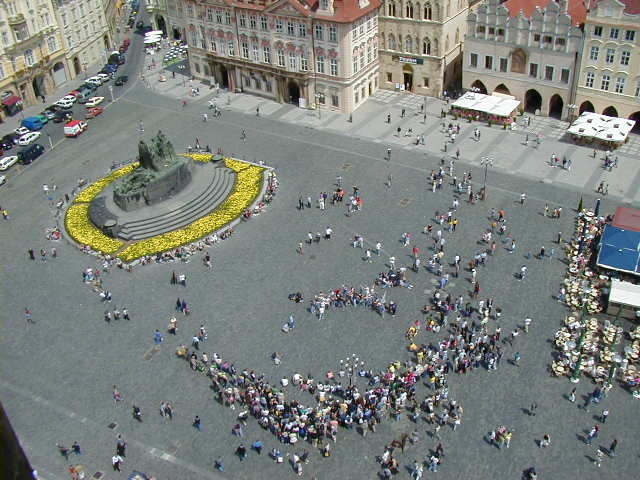 Prague is fun! There are plenty of reasons; the city is beautiful, the women are beautiful, the people are friendly, and the beer is fantastic and really cheap. The Czech Republic has a beer called Budweiser, that is sort of like the U.S. Budweiser, only good. Really good. The Czech pilsner is the best I've ever tasted. But you've got to go to the Czech Republic to try it. Good beer doesn't travel well. 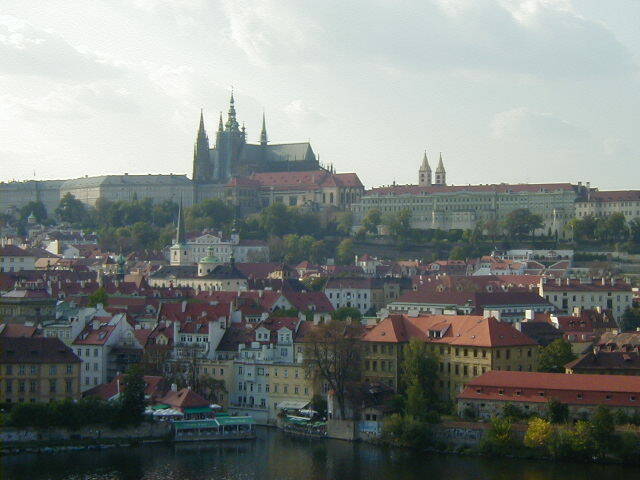 Beer in Prague costs the equivalent of fifty cents a half liter in the bars. In the stores beer is cheaper, even cheaper than bottled water. But you may as well drink in the bars. At a dollar a liter, a few dollars of beer in the bar will get a person quite buzzed. At a dollar for two liters, a few dollars of beer from a store is a lot of beer. For those of you with no grasp of the metric system, a half liter is a little more than a pint, and two liters is a little more than five twelve ounce beers. If you're not into beer, you can also get Absinthe in the Czech Republic. 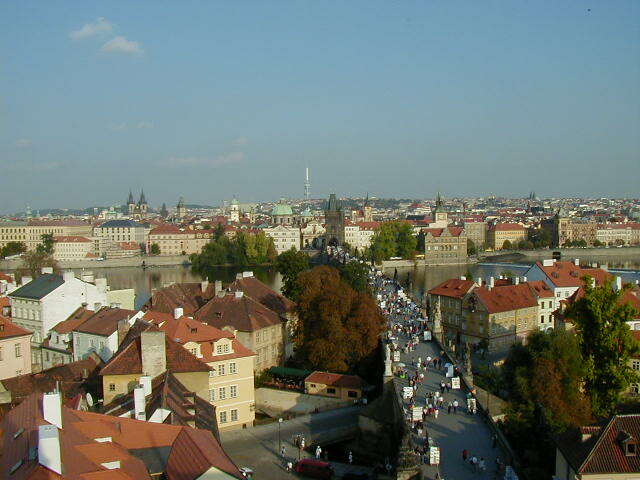 Actually I think you can get almost anything in Prague. I drank absinthe in Barcelona, but it was 107 proof, the weak stuff. I don't recall the exact proof of the absinthe in the Czech Republic but it is about as potent as mid-octane gasoline. I didn't try it. I know I should have--it's one of the "must do" experiences and I feel terribly guilty about missing it. But the beer was so good I just couldn't waste a drinking opportunity on anything else. I got a bed at the Dlouha Pension in a four person room. I don't recall the price, I think it was about ten or twelve dollars a night. The name says Pension but it was run like a hostel. 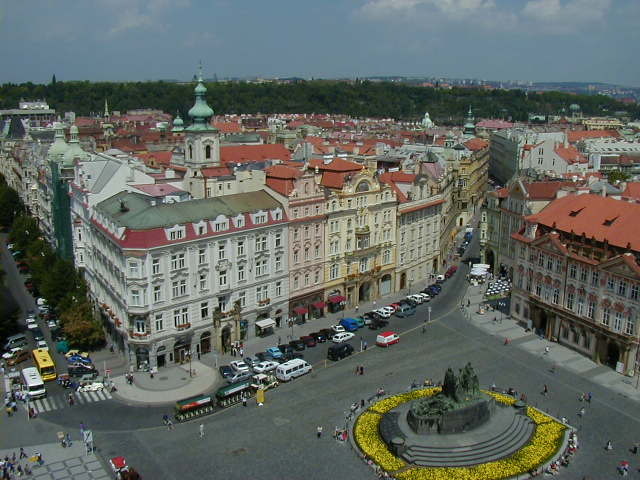 In Prague hotels near the center are expensive, so if you want cheap convenience you go for a hostel. That is not a problem; Dlouha Pension was fun and convenient. It is in walking distance of most of the sights, has a bar on its top floor, and is a good place to meet people. 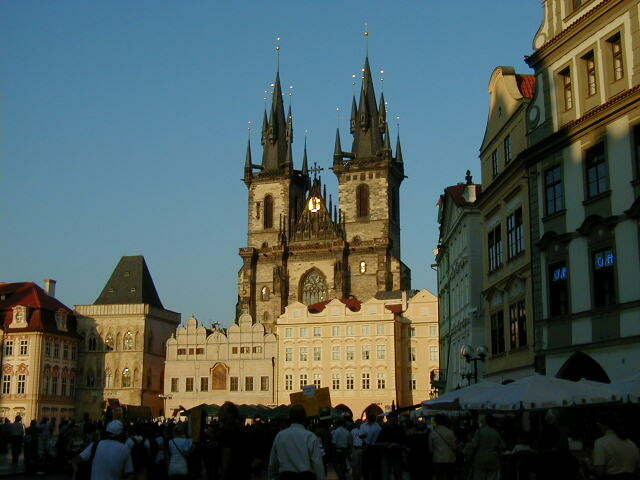 There is interesting night life in Prague. If you're a responsible and moderate person like me you will probably be able to get to bed before sunrise most nights. The young people who were there to party would get to bed around ten in the morning. The one's who found something good would disappear for indefinite periods. 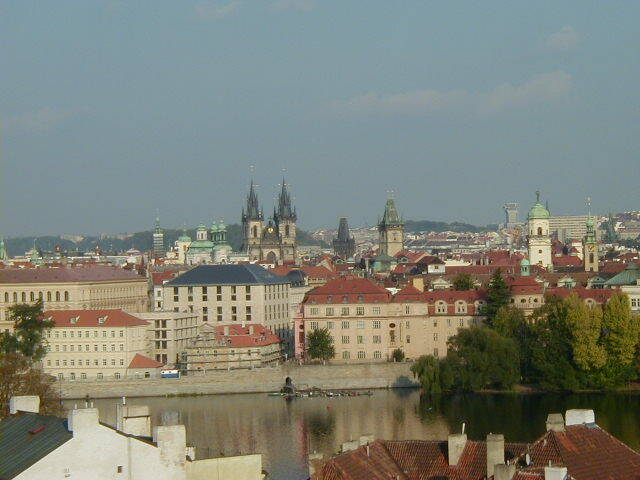 Surprisingly, I don't have any interesting Prague stories to tell. No smugglers, con artists, pick-pockets, crooked officials, dark holes in the ground or impromptu shows that made for good stories from other parts of Europe. 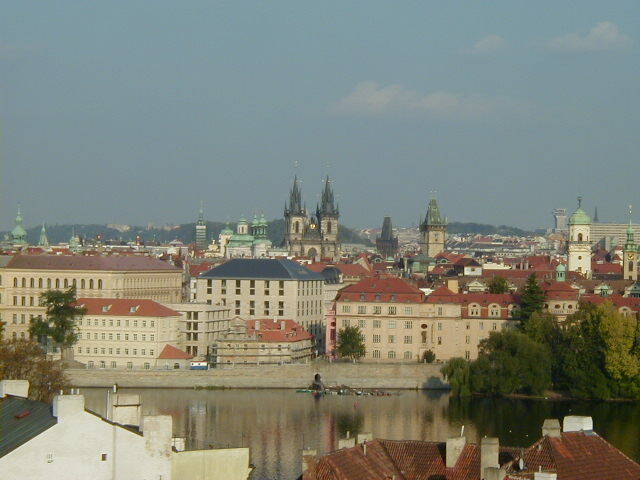 There was the evening in a bar where some of the women took there tops off and danced on the table, but that doesn't count as a Prague story since they were tourists. 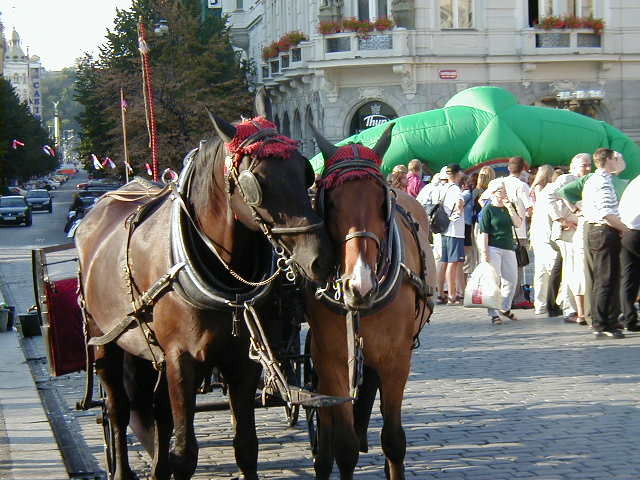 Really drunk tourists. Drunk and attractive tourists. Probably American college students. 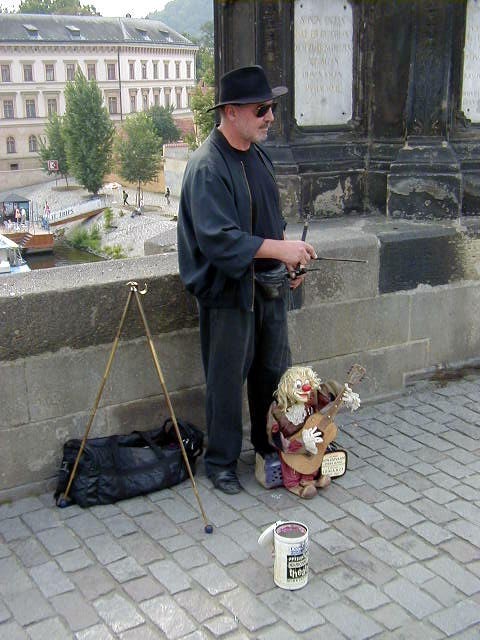 I can't count tourist antics as an authentic Prague story, that would be cheating. 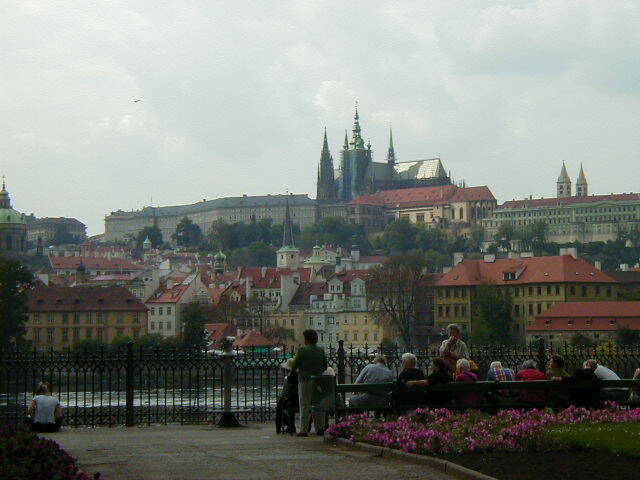 It was even less of a Prague story since I was there with two Irish women I'd just met in my room. The hostel rooms were coed. That takes a little adjustment but it works. 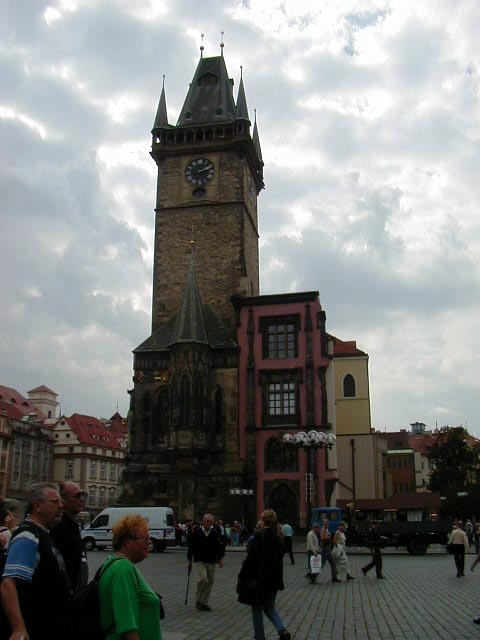 The bar is called the Twelfth Century and is on the south side of Old Town Square, which is the big square with the old town hall and the famous Astronomical clock. The bar was really popular with the backpacking crowd, and had lots of American college kids demonstrating their competence, or incompetence, in drinking. I only went there a few times. There was also a bar called the Roxy next to the hostel I stayed at, but it was for the younger crowd. Really young. I saw customers lined up to enter and the average age looked to be about 16. I was afraid to go into that bar. 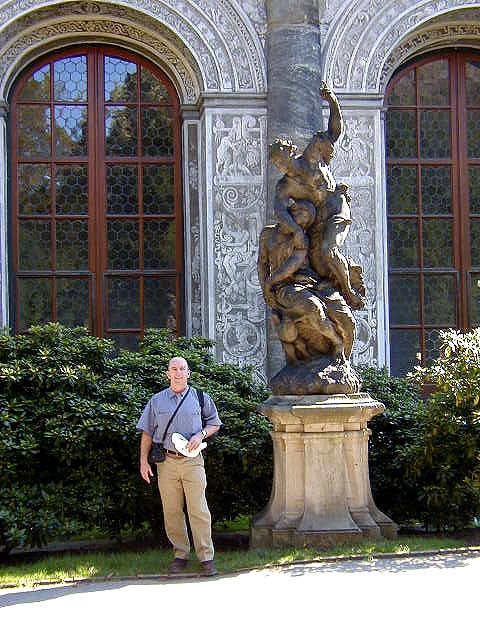 I went on a lot of organized walking tours while in Prague. 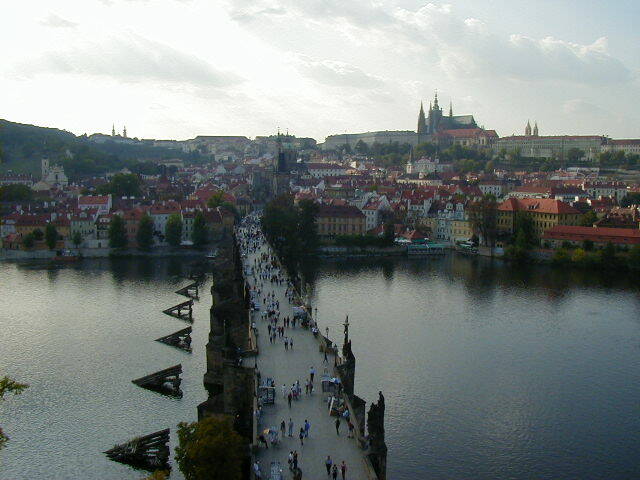 They were an excuse to hang around Prague a while longer, as in "I can't go yet, I haven't taken the Kafka tour". I think the Kafka tour was the only one I missed, so now I have a reason to go back. 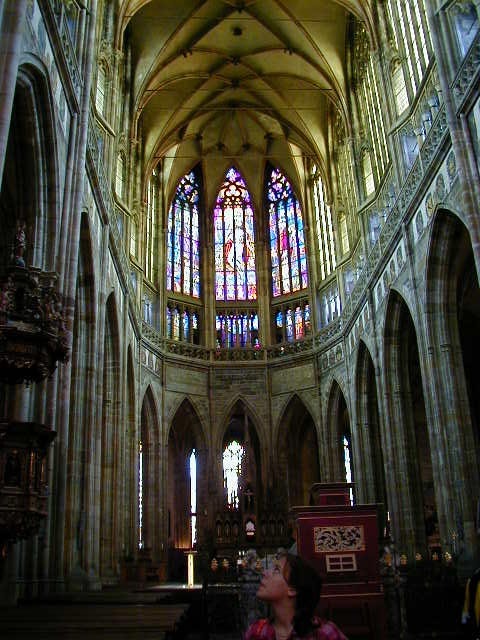 I did go on an architecture tour, a history tour, a Dramatic Century tour, a Haunted Prague tour, and even a Pub crawl tour. The Pub Crawl was fun. It started a 7:30 in the evening and was supposed to be a three hour tour. A three hour tour. The drinking started getting rough, the tourists they were sloshed; if not for patience of the friendly guide the drunkards would be lost. We kept the guide busy until sometime past one in the morning. 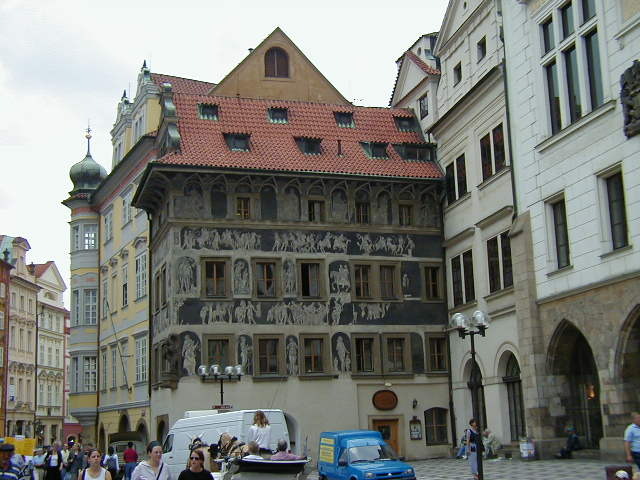 Prague is also known for its' Black Light Theater. That is Theater that cleverly uses lights, colors and black curtains to give the impression that people and objects are defying gravity. If you've seen it you know what it is, if you haven't I can't explain it any better. I went to see "Aspects of Alice", recommended in a Prague entertainment paper. I started out skeptical but quickly got hooked. Before the show was over I was really into it. 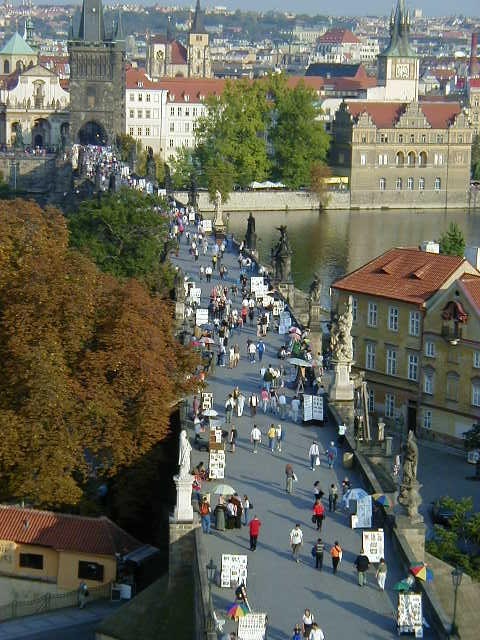 If you go to Prague, check it out. 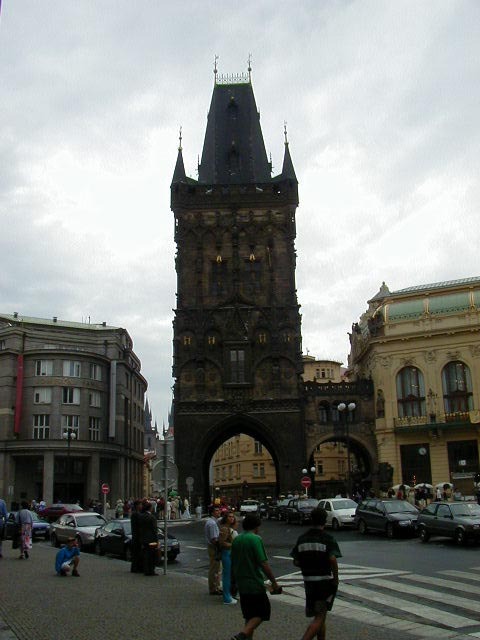 I don't recall the theater's name, but it will be in the English language entertainment paper and is somewhere between Staromestske namesti and Karlov most (Charles Bridge). After "Aspects" I went to a tourist oriented show at the Image Theater. Don't bother with that one, it has been dumbed down for the tourists. Now for the pictures. 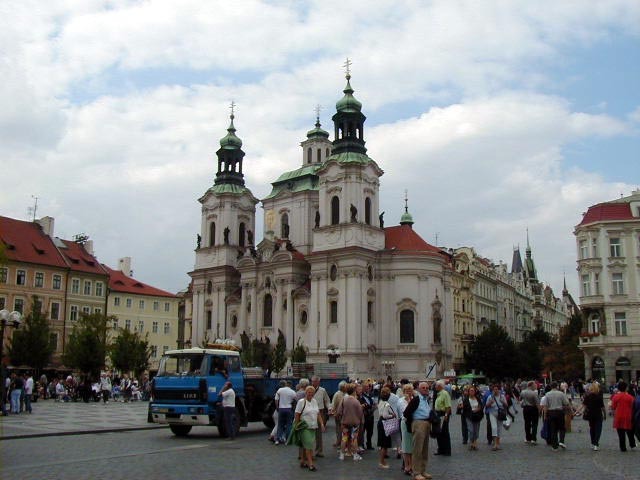 Prague is a big city, but most of the sights of interest are inside the historic center in walking distance of each other. 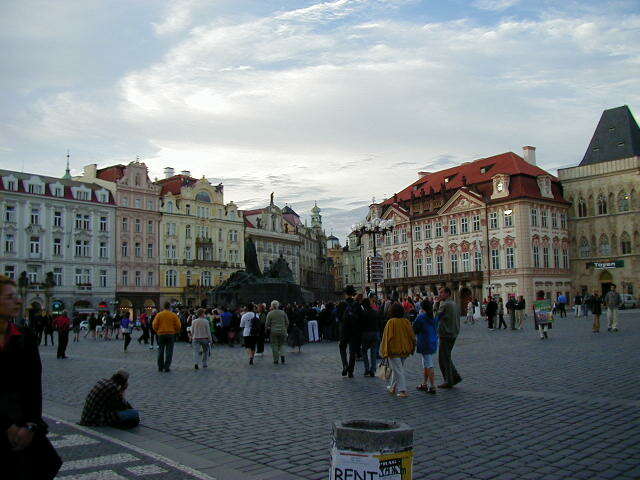 In the center of historic Prague is the Old Town Square, which is the most beautiful and lively square I've seen. 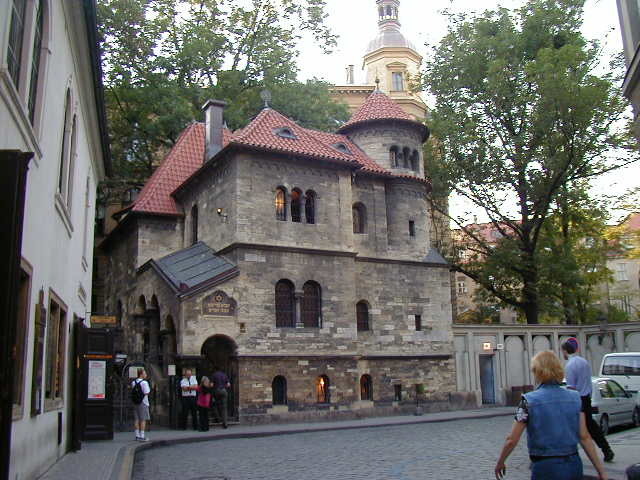 It was only a short walk from Dlouha Pension and on my way to Charles' Bridge and the castle, so I passed through it many times. I always enjoyed it. 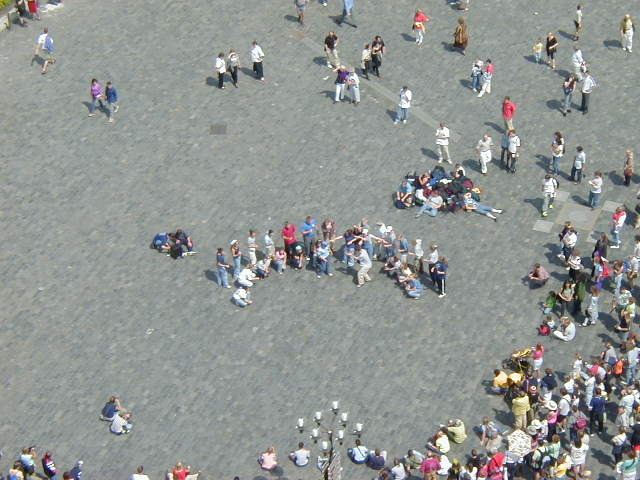 I took the first set of pictures from the top of the Town Hall tower. 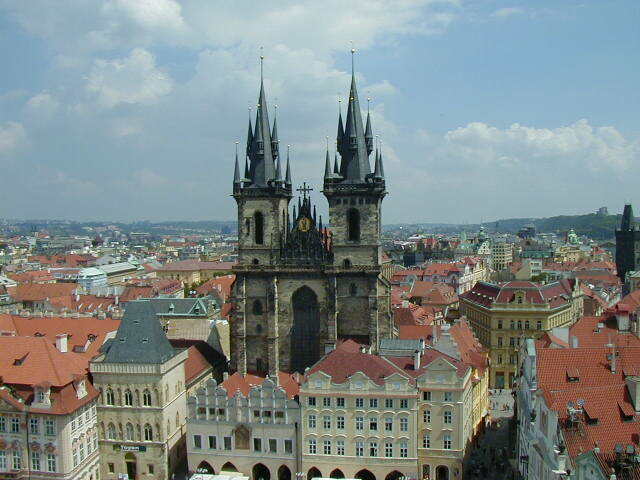 The interesting towers in the first picture are on the fifteenth century Church of Our Lady Before Tyn. 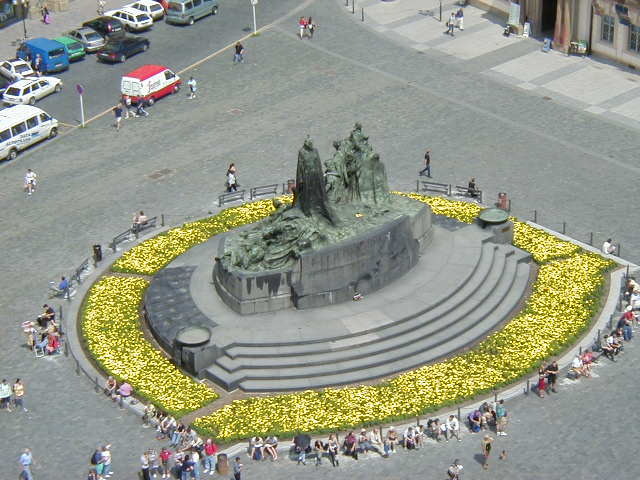 The statue surrounded with flowers in the square is of Jan Hus, an early Christian reformer who was burned for heresy in 1415. He objected to the Church policy of allowing rich people to pay to be absolved of their sins--his heresy was objecting to salvation for sale. The next two pictures show an American Christian singing group. 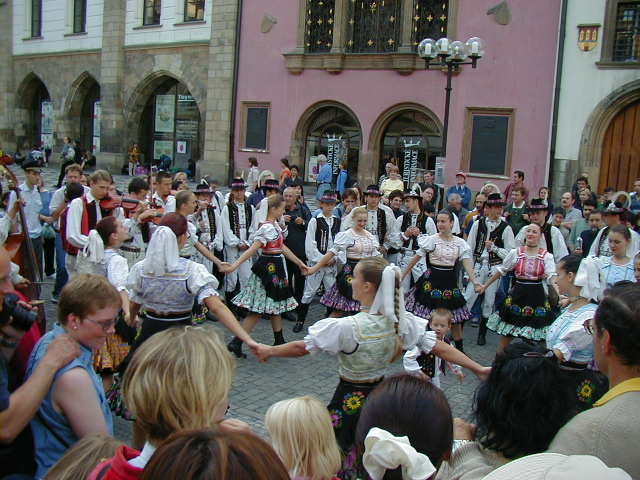 They did a song and dance number to the puzzled non-English speaking people on the square. 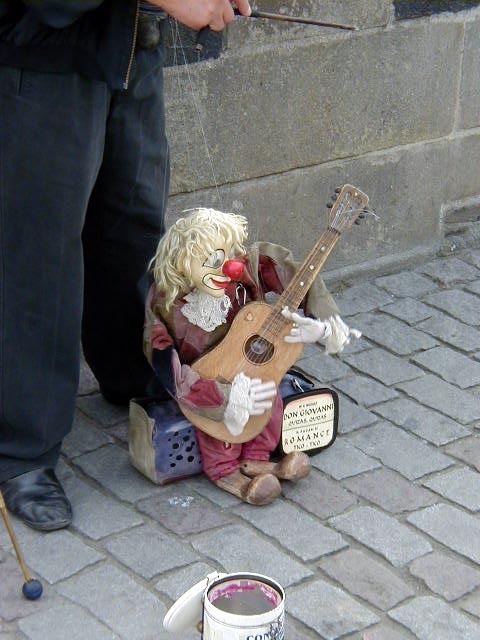 One member of the group was designated the devil and the rest abused him while singing "You are the devil and the devil is bad". I could make out the chorus from the top of the Town Hall tower, to my regret. The sophistication and depth of this message was underwhelming. 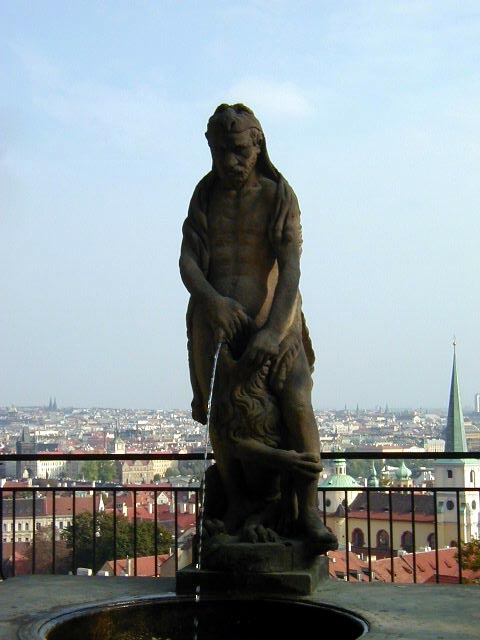 Perhaps inspired by the Jan Hus statue, at the end of the song they gathered some MFEM and burned their designated devil at stake. I believe that's called "method acting". From street level are some other pictures from the Old Town Square, some of the surrounding buildings, and someone about to get married. 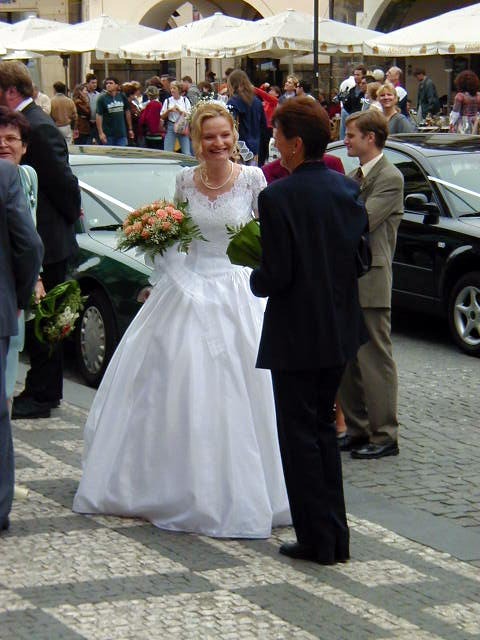 The Old Town Hall was a popular place for weddings. 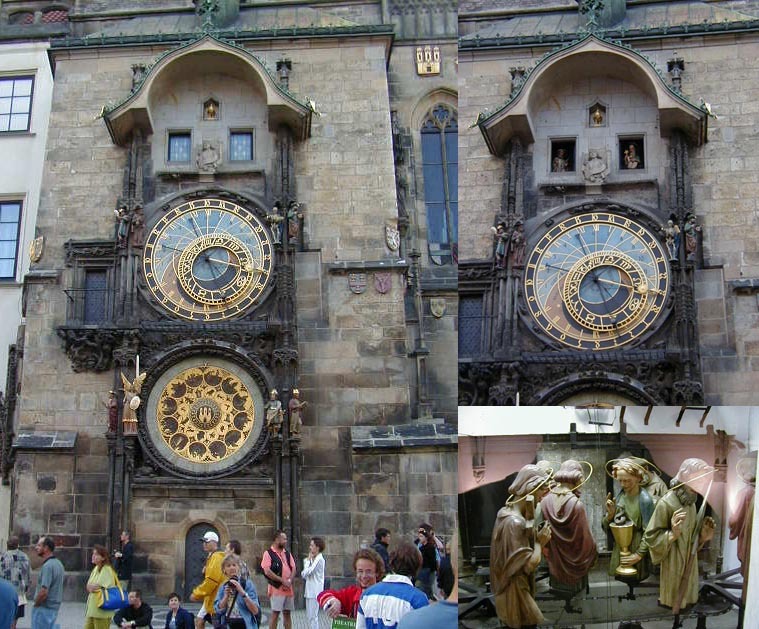 On one corner of the Old Town Square is the Town Hall and its' famous fifteenth century Astronomical clock, with the Apostles that "parade" by the doors over the face of the clock during the striking of every hour. If you know how to read it the clock will give the time, season, the time of sunrise and sunset, the phase of the moon, and zodiac information. I couldn't figure it out; when I needed to know the time I checked my watch. 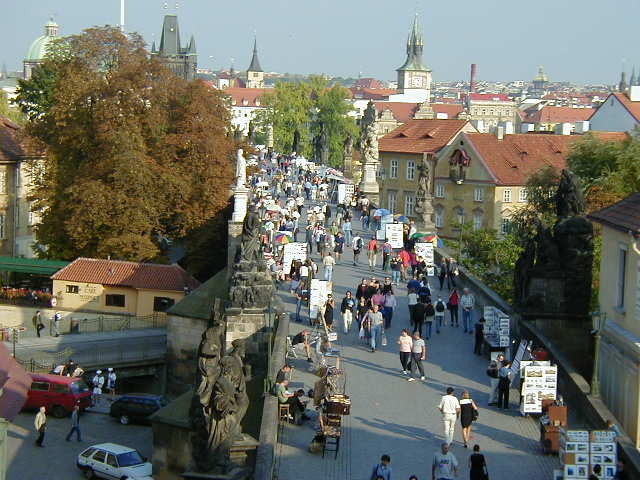 Charles' Bridge, crossing the Vltava river, is Prague's most well known landmark, lined with religious statues and full of street performers and vendors. 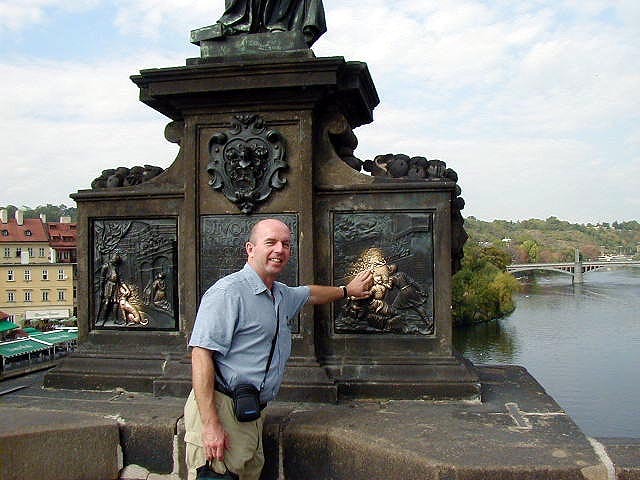 The last two pictures are of me and the statue of St John of Nepomuk, the patron saint of the Czechs. Touching his relief on the base of the statue is supposed to be good luck. I did it just as an excuse for a picture. There are towers on both sides of the bridge which I used to take some shots of the bridge and the city. 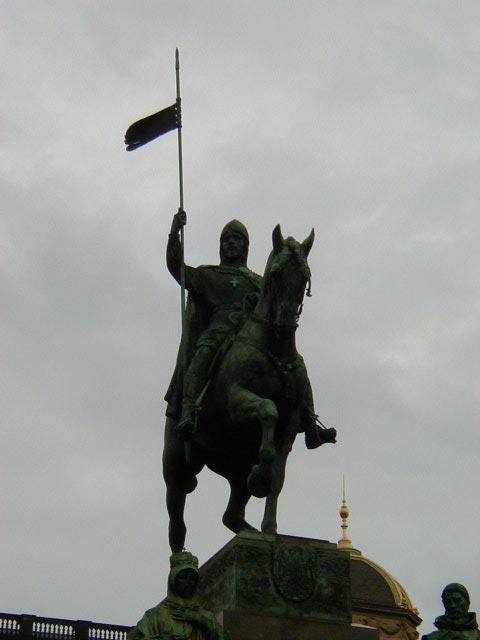 Some shots from around Prague, starting with a statue of St Wenceslas on Wenceslas Square. You know that Christmas song "Good King Wenceslas"? Well, he was actually Duke of Bohemia in the tenth century and made Christianity the official state religion. 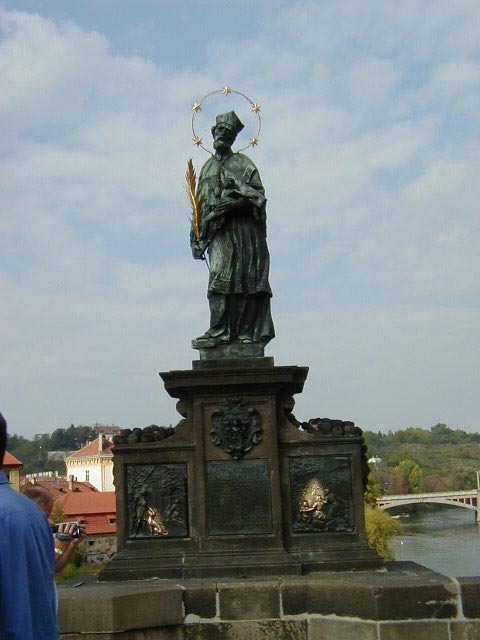 He is the patron saint of the Czech Republic, not to be confused with the patron saint of Czechs, which is St John of Nepomuk. 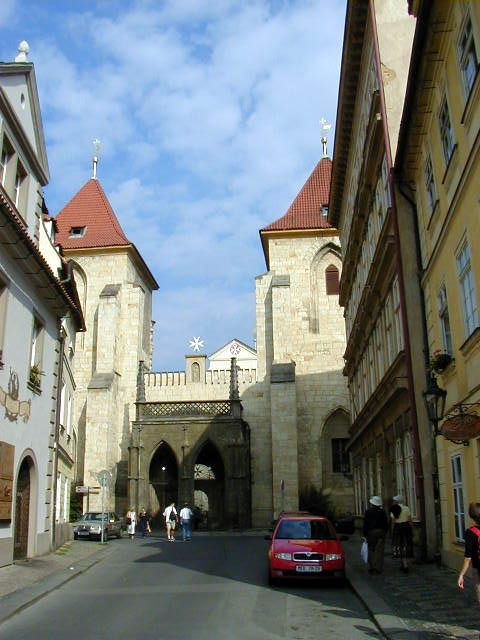 The second picture is the Powder Tower, built in 1375 and one of old Prague's city gates. 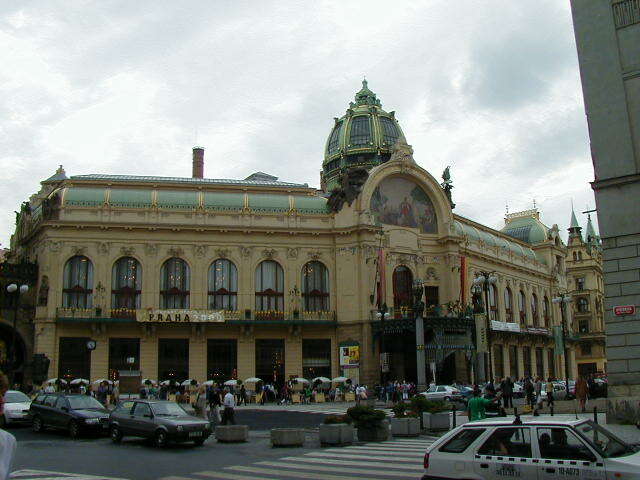 Next to the Powder Tower, in sequence of pictures and physically next to it in Prague, is the early twentieth century Art Nouveau Municipal House. 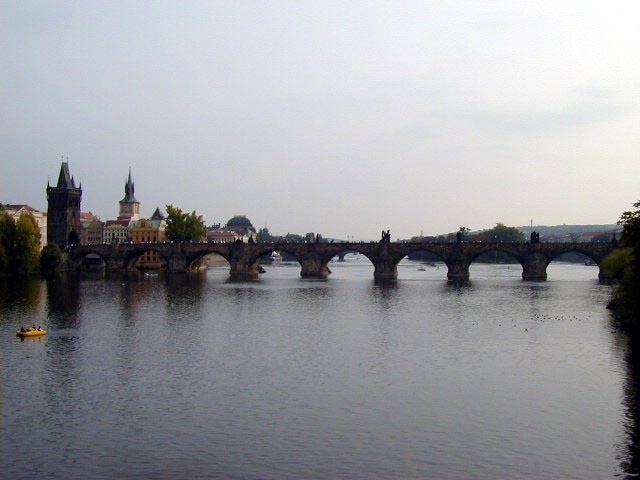 Following that is a picture of west Prague across the Vltava river, followed by streets, interesting buildings, rooftop views, the 1694 Klaus Synagogue, and finally the old Jewish cemetery. 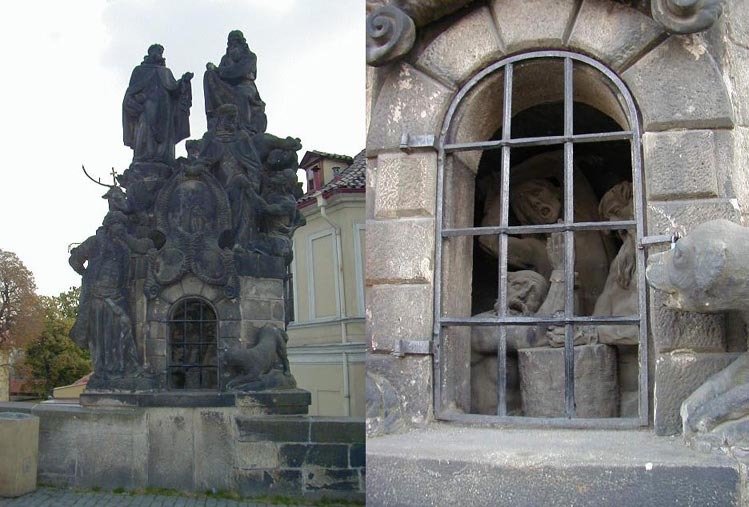 For centuries the Jews in Prague were kept in a small walled off ghetto and were severely limited for space. 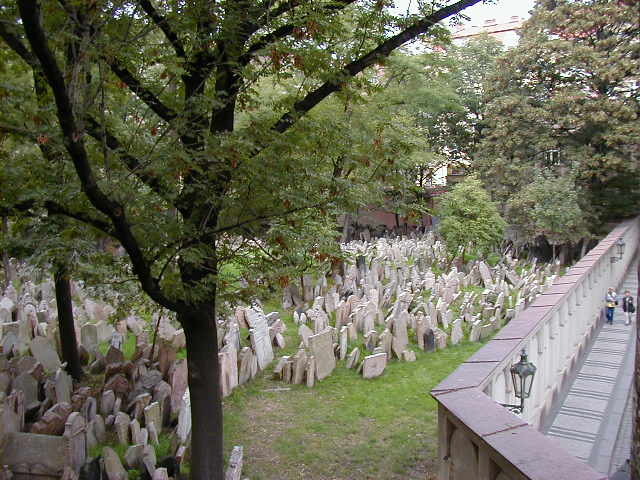 This led to a really crowded cemetery, among other problems. 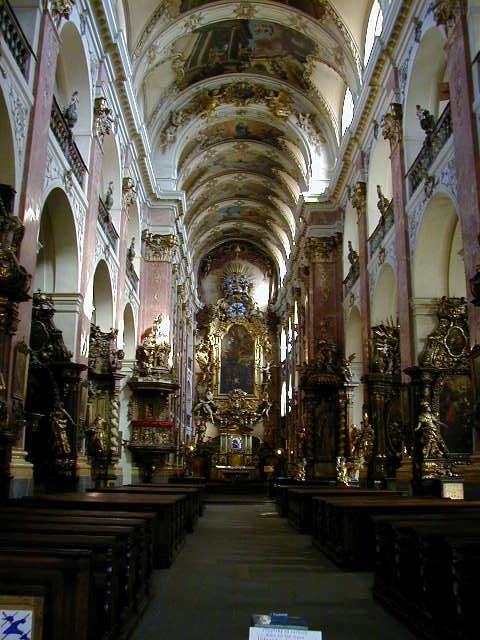 Next is the baroque interior of St James Church. 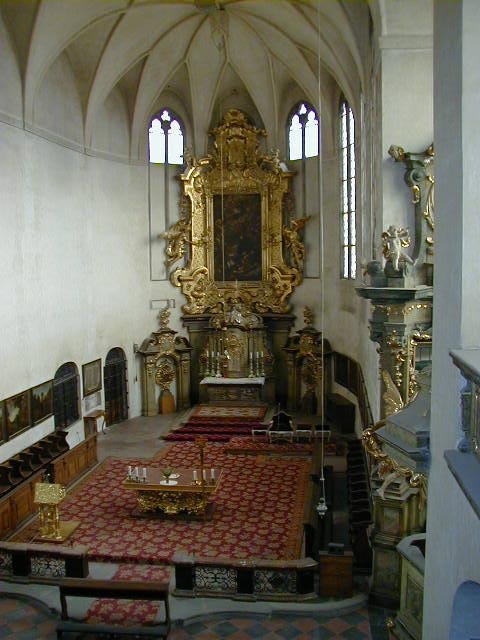 The church was built in the fourteenth century but the interior dates from the eighteenth century. 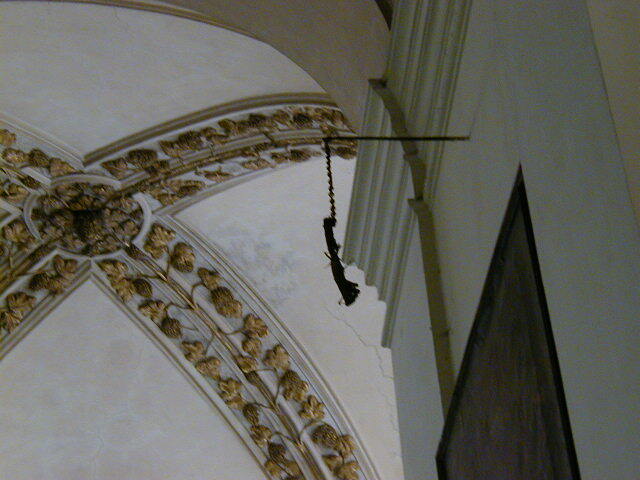 Hanging from a chain near the entrance is the arm of a thief caught in the church sometime around 1400. Legend has it that the thief was trying to steal some jewels from a statue of the Virgin. The Virgin came to life and grabbed his arm and would not let go, requiring its removal. 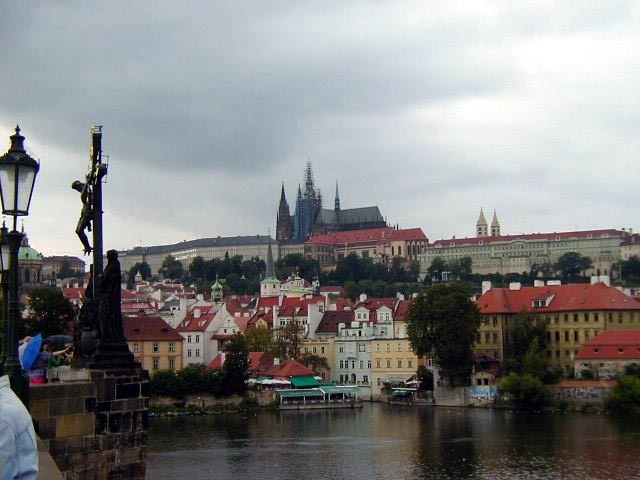 On the west side of Vltava river is Prague Castle. 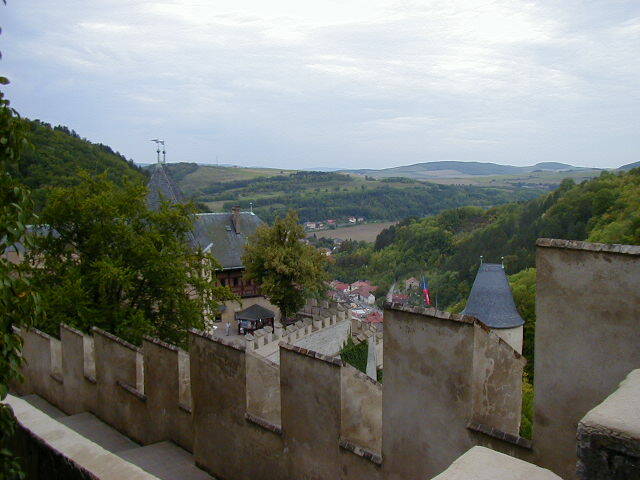 Started in the ninth century it is the largest ancient castle in the world. 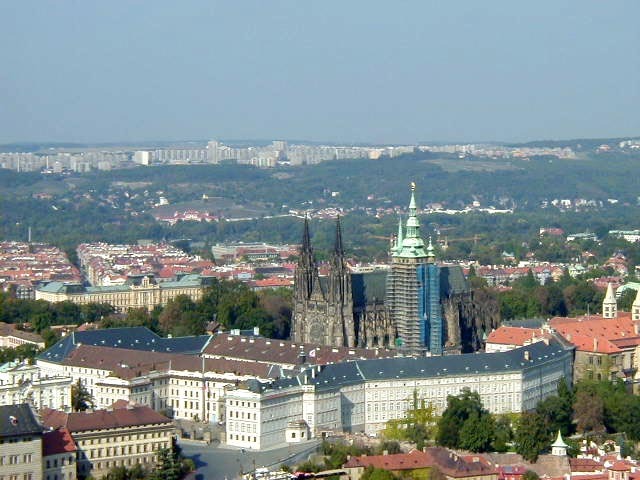 It is a complex of palaces, halls, chapels, courtyards, a convent, St Vitus Cathedral, gardens, etc. 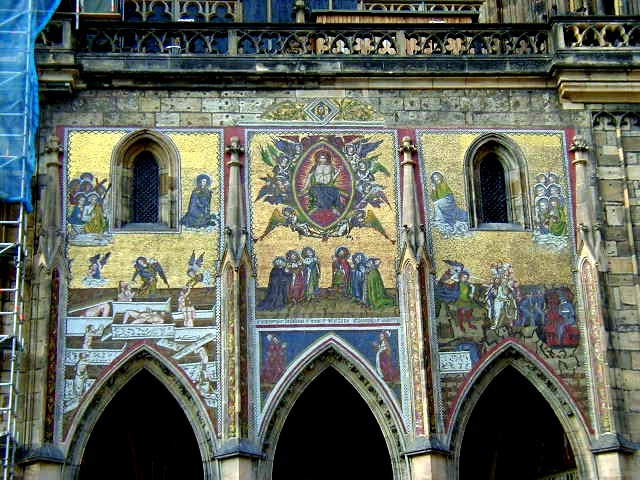 The first series is of St Vitus Cathedral; the inside first, followed by a picture of the recently restored mosaic on the outside, and the flying buttresses holding up the roof of the Cathedral. 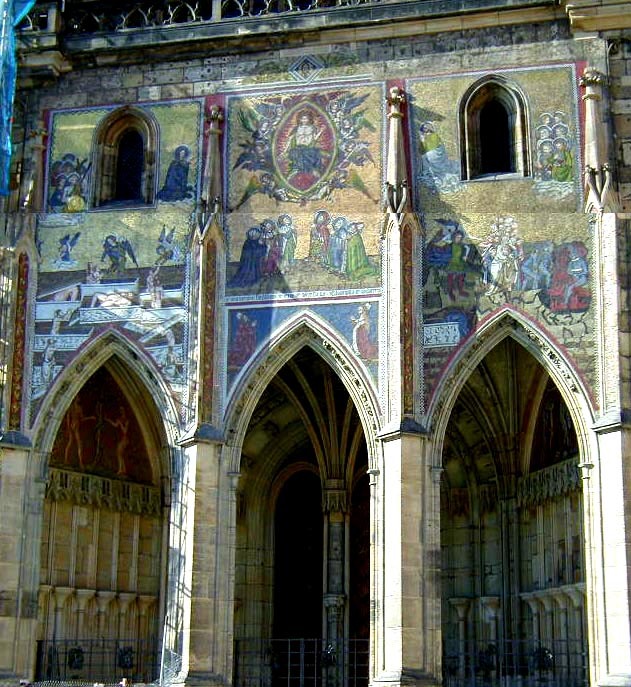 Also in Prague Castle is Vladislav Hall in the Old Royal Palace, built in 1135. 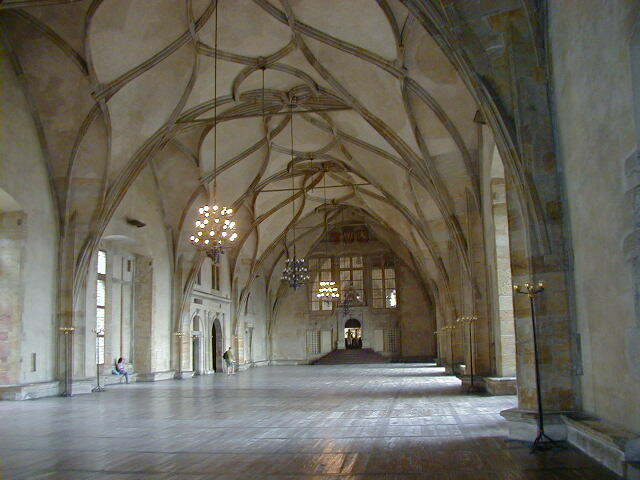 The hall served many functions, including jousting tournaments. 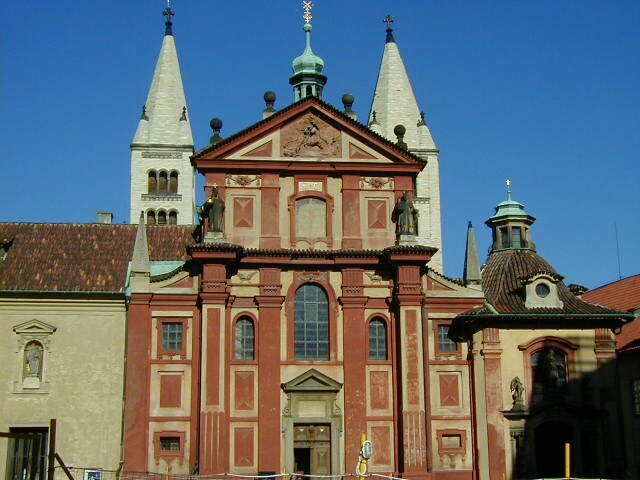 Following it is the All Saints Chapel, also in the Old Royal Palace, the Basilica of St George, and some garden shots, including me in front of the Ball Game House. 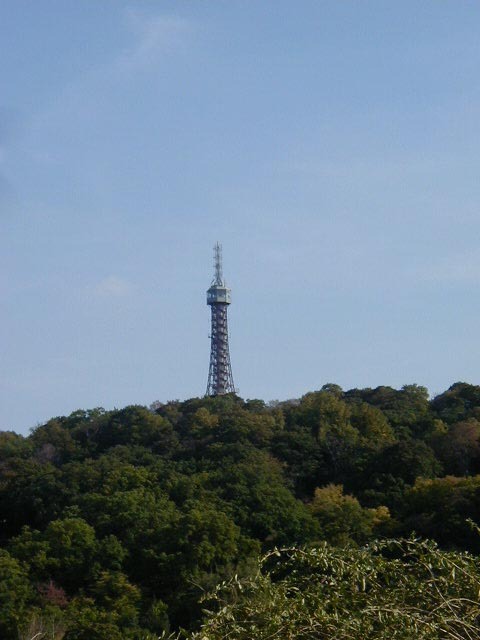 On a hill southwest of the castle is a replica of the Eiffel Tower. 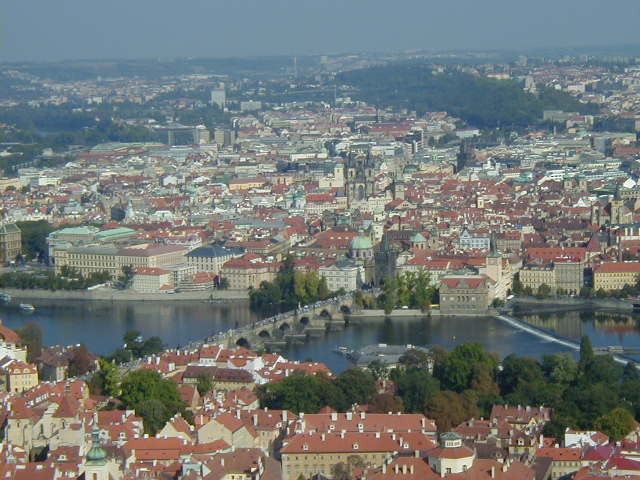 It's only about one quarter of the size of the real thing, but you can get some great views of Prague from the top. 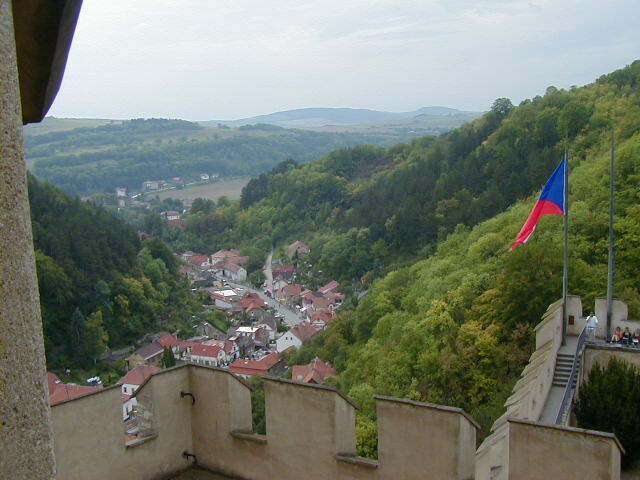 A short train ride from Prague is the village of Karlstejn and Karlstejn Castle. It's a small castle but very photogenic. 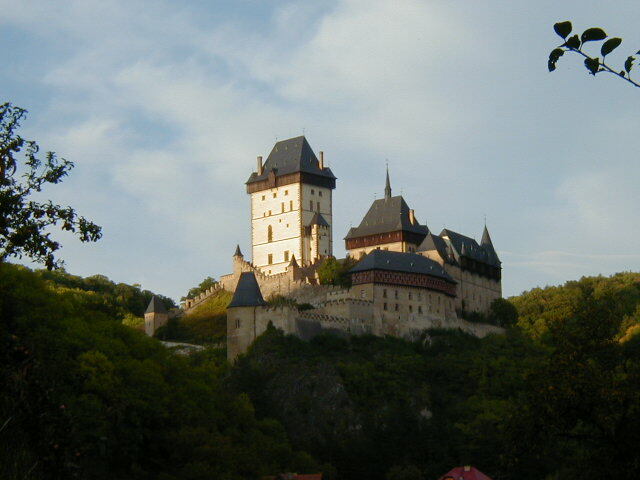 The castle was built in 1348 as a royal hideaway and to house the crown jewels of Bohemia. 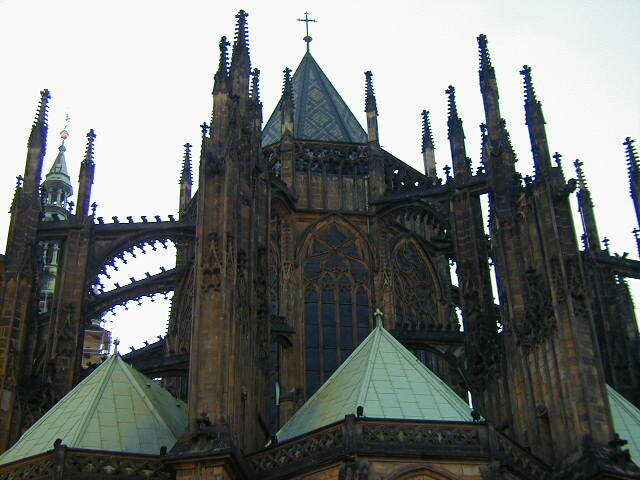 It was remodeled in the nineteenth century. I couldn't always tell which parts were old and which new, but the central tower accessible by bridge was definitely part of the original design. 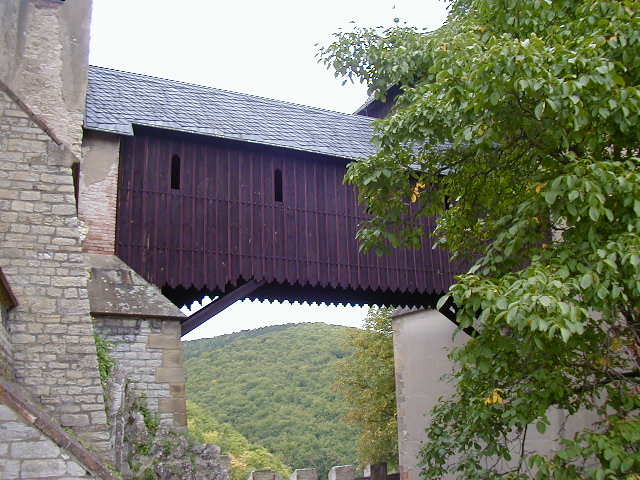 If the rest of the castle was overrun the defenders could flee to the central tower and burn the bridge behind them. If I remember correctly the castle tour guide said the occupants had to resort to this once, and they managed to hold out in the central tower until help arrived. 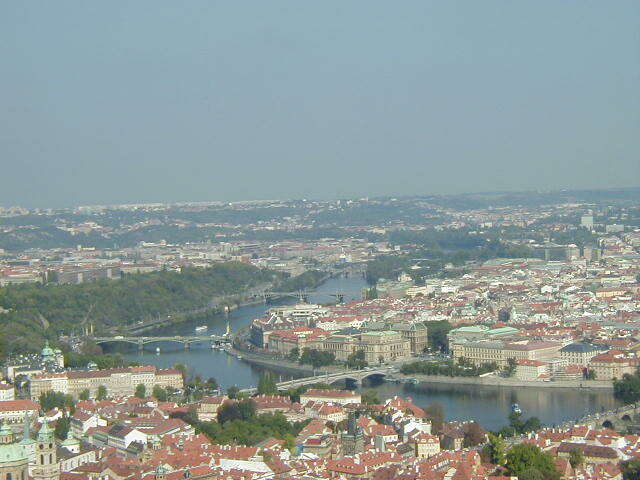 That was all I did in Prague. A lot of guided tours, self guided tours, a couple of shows, and lots of bars, beer, and interesting people. No wild adventures, but I still want to go back for a long stay. 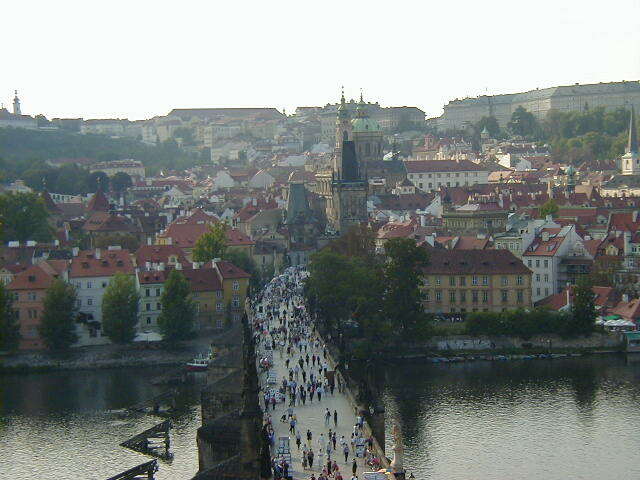 Prague is beautiful and fun. 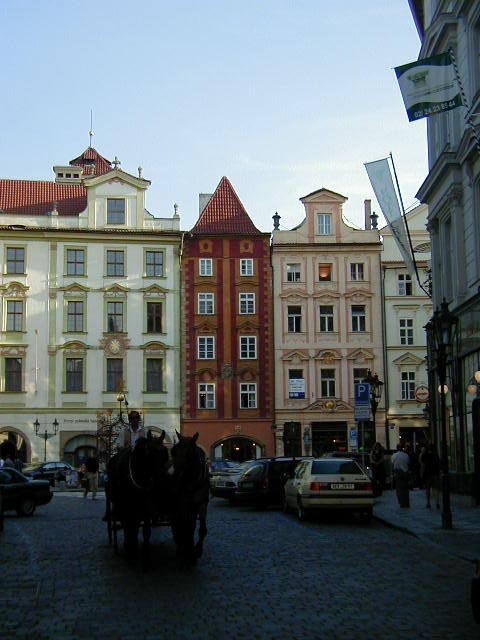 From Prague I took a train to Cesky Krumlov.